Jughead Jones is the narrator of the Riverdale Netflix series. His narration reveals the emotions that the other characters, Betty, Veronica and Archie experience as they live through the darkness of Riverdale. He is not the nerdy hamburger loving Jughead of the Archie comic books. 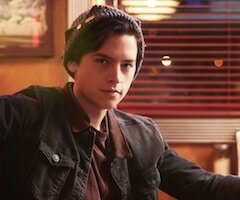 The Jughead of Riverdale series is the dark, thoughtful outsider who connects with the in crowd. He is the son of the leader of the South Side Serpent Gang. Jughead reluctantly takes on his father’s role. Jughead defends those, like him, who grew up on the wrong side of town and want respect. He is dating Betty Cooper, the good girl from the comics, who has a bad girl side in the Netflix series. Other friends he has at Riverdale High are Archie Andrews and Veronica Lodge, they are all good pals and hang out at Pops for milkshakes. Click here to find more Riverdale costumes. Find below Jughead Jones costume ideas. This costume is best paired with Archie, Veronica, or Betty. 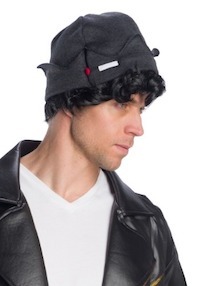 The officially licensed accessory is a gray beanie with a crown-shaped, flip-up band with black wavy hair attached to the bottom so it’s like two disguises in one. Supply the mysterious and philosophical attitude and more than half of the transformation is complete. 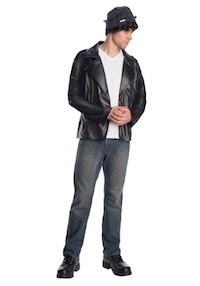 Now you can join the pro-Juggie gang with this Riverdale Jughead Jones Men’s Costume! It’s a licensed look right out of the show, and it’ll make you the talk of the town (right after the Black Hood, that is). You get a bonafide Southside Serpent, snake-emblazoned jacket, which you can easily slip over your own dark denim, or a plain tee. Click here to get Riverdale Costumes Jughead Jones Costume.